We may refer to 'Jerk', 'Dry Rubs', 'BBQ rubs', or 'BBQ seasoning" as dry rubs when answering questions. Scroll down the page or click on question below. A brief history of BBQ. How do you use a dry rub properly? Does BBQ seasoning dry rub need to "marinate"? How much meat Knox's dry rub seasonings flavor? Can Knox's gourmet dry rubs be used on anything else beside meat? Is salt necessary in dry rub? Are Knox's dry rub seasonings Gluten Free? When Columbus reached the West Indies the native cultures would cook meat on racks over coals. They called it "Barbacoa". Who called it? Who knows. It was a long time ago. But we do know "Barabicu" is or was a word used by early Caribbean natives meaning ‘sacred fire pit’. This and every possible combination of fact and fiction make up the history of BBQ. We know that people have been eating meat since the beginning of time and people have been flavoring the meat for just as long. So believe what you want and eat what you love. Find Dry Rub recipes here. Dry rubs are a mixture of spices, herbs, salt, sugar and various other seasonings depending on your location. Although we love dry rub we could not find much information about any specific origin. It is suggested that cowboys of the American west probably coined the phrase but we can not be sure. Please write us if you have better information. The origin of "Jerk" date back to the Arawak Indians. Over the years Jerk style seasoning have been enhanced by traders, pirates and African slaves who introduced new spices, herbs and flavors from all over the world. The word Jamaica (Xaymaca) also comes from the Arawak Indians, meaning the land of wood and water. Jamaica with multicultural ports had access to a wide variety of herbs and spices that all made it into the foods of this region. Originally a basic Jerk recipe would consist of Allspice (Jamaican Pimento) and probably Scotch Bonnet chilies. Thought to have been perfected by Maroons (Escaped African slaves) and their knowledge of slow pit cooking as a form of preserving their meat. Jerk seasoning can be as simple as Allspice, chilies and salt or as complex as 20 or more herbs and spices. Dry rubs, as the name suggests, are rubbed into meat. For best results, especially with chicken, remove the skin or excess fat from the surface. Using an olive oil, butter or vegetable oil and rubbing the spices aides in releasing the flavor of the seasonings. You can use your hands or you can place the meat in a plastic bag with the rub to cut down on the mess. Does dry rub or BBQ seasoning need to "marinate"? Rubbed meat can sit in the fridge to allow it to intensify but you can also begin grilling as soon as you apply the dry rubs. Dry rubs, like any seasoning can be applied once meat is cooked as well. This really depends on what you like but a jar of Knox's all natural BBQ dry rubs (Chipotle BBQ, Jamaican Jerk, Cracked Pepper or Yummy Chicken) should be plenty for 12 or more pounds of meat. 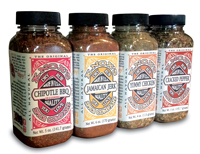 Our Knox Bro's Brand seasonings can be used on 8 or more pounds of meat. Depending on how intense you want the flavor you could get more from your seasonings by applying them more sparingly. Absolutely! We have used our Chipotle BBQ Rub in sauces, on baked potatoes and in mashed potatoes as well as on popcorn and shrimp. We have used our Cracked Pepper dry rub on salad, in salad dressings and in soups and the Jamaican Jerk dry rub on grilled vegetables. Our gourmet dry rubs are intense with flavor and aroma so be sure not to overdo it. See our recipe section by clicking here. No, although besides being a flavor enhancer, salt aids in retaining moisture in meat. There is a scientific explanation about how salt binds with natural proteins but that is a discussion for another day. Our dry rubs use salt to enhance flavor but we do not use salt as a filler or the base for our rubs. Yes. Our dry rub seasonings are gluten free. "My personal recommendations are Knox's Chipotle B-B-Q Dry Rub..."
"...favorite commercial rub, hands-down, is Knox's Spice Company Chipotle BBQ Dry Rub"